Let me tell a story about an interesting part of Mary's Magical Adventure that dates back to just after the name change from World of Kirbycraft, v1.6. There was a mysterious place that Mary could visit, planned reachable at the end of each level. Its name was the Hall of Challenges. Okay, let's end the story-like writing here! 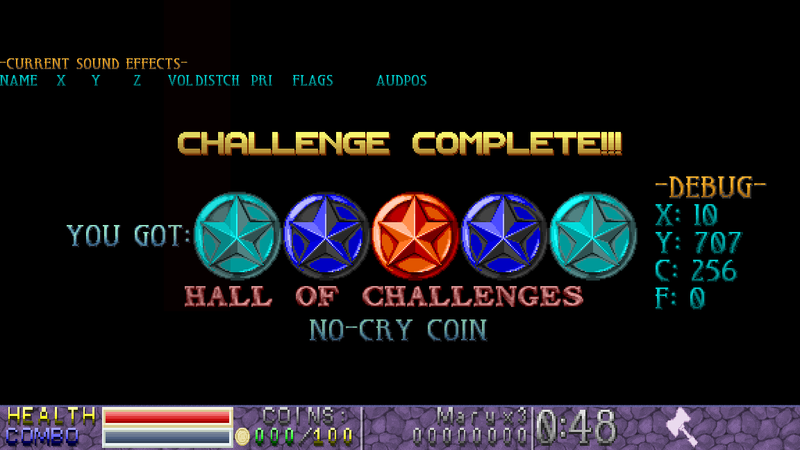 The Hall of Challenges wasn't as good as I was expecting it to turn out during development, but it was a good idea. 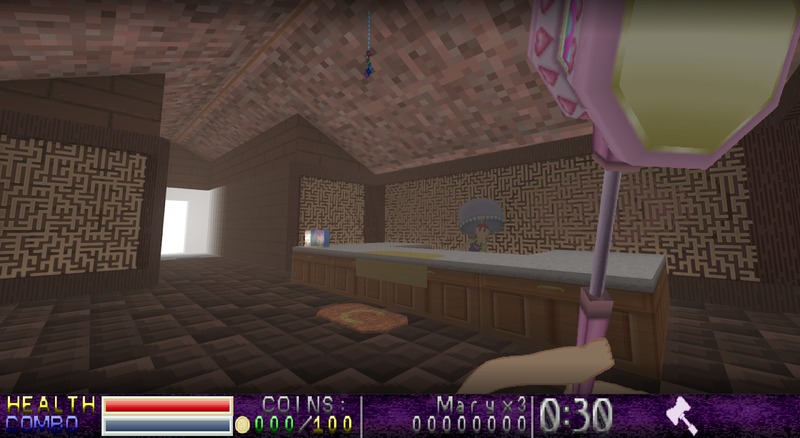 It allowed me to reuse levels I spent weeks working on with minor script adjustments. The thing is, being able to be sent off to a random location after each level didn't make much sense (even though a similar thing is allowed in later versions, warping to the Small Hut). 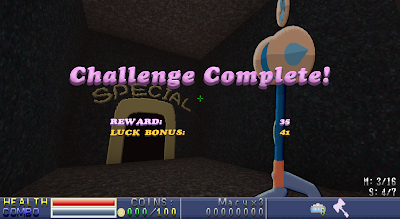 Additionally, completing special stages in v1.6 advanced you to the next level, so if you chose to challenge a special stage, you wouldn't be able to visit the Hall of Challenges. This was done because the special stage is a separate map that the player is warped to, which made the game forget what happened in the proper level. 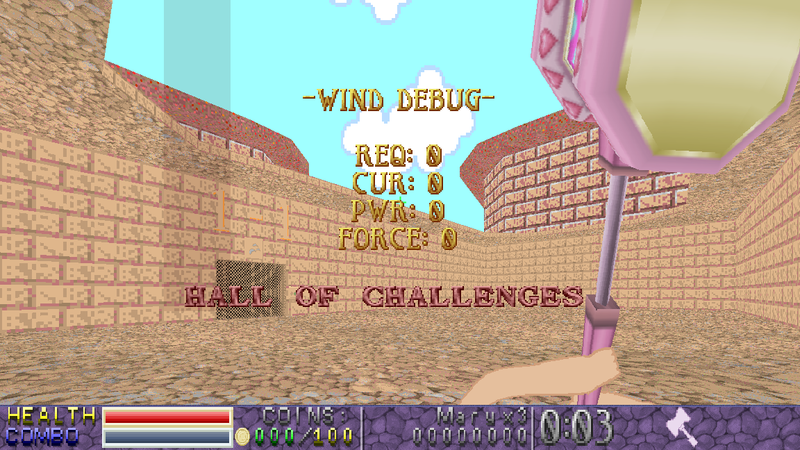 These reasons are most likely why the Hall of Challenges was removed after v1.6, since special stages were modified to allow returning to the special stage entrance the player used. If you think this looks hard, the wind makes it harder! Since it was removed so fast, only one challenge was created, though other types were functional if forced on. As shown in the second picture above, it was a unique challenge; Mary had to survive for a certain amount of time (which varied depending on difficulty) while really fast versions of the yellow HCPD officer chased you around. 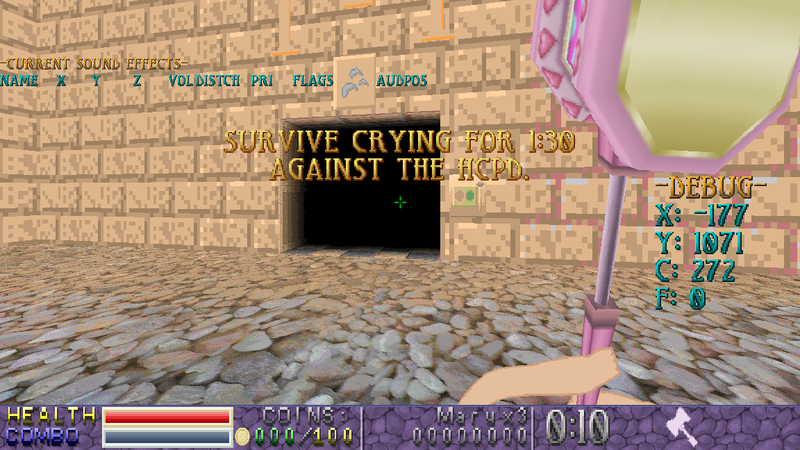 In v1.6, the newly-added wind was enabled at power level 3 in 1-1 and Mary couldn't Air Dash while crying, so controlling your movement to escape the cops was nearly impossible! If you died, the dispatcher insulted you then you returned to the Hall of Challenges; Failing any challenge would just return you there. Congratulations! You got the Heal Coin...I think! This is the Damage Coin's DECORATE properties. 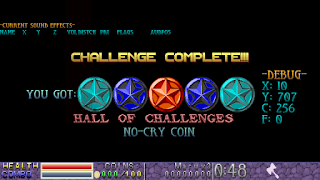 If you completed one, you would earn up to five Powerup Coins depending on your difficulty and the challenge type. If you already completed this challenge, you would only get half. After this, you would advance to the next level. 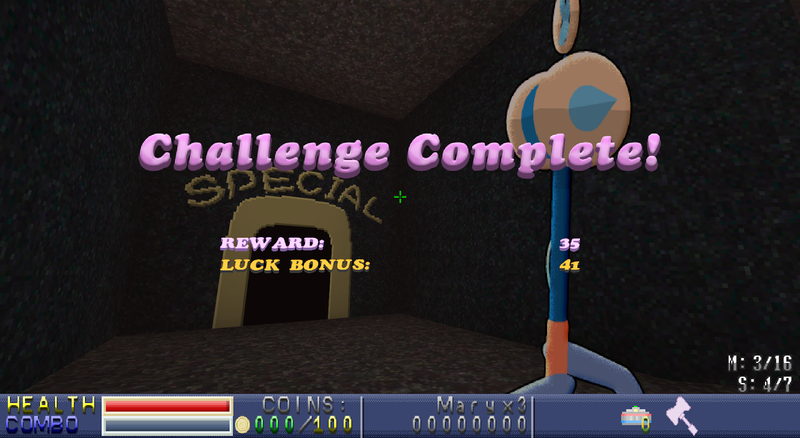 Although nowadays these coins are easy to come by, able to be purchased from the Small Hut and found within the levels, back in v1.6 they were your reward for completing challenges. In fact, even in v1.9 they are sometimes referred to as "challenge" internally even though this version of the challenges is no longer used. So wait, you're telling me Jane never noticed that rug? But wait, what do I mean by "this version"? 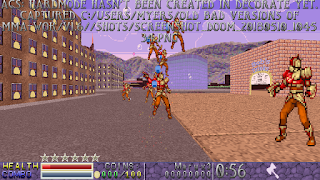 Well, reader, the challenges are planned to return in either v1.95 or v2, the ZDoom Demo. If you've looked closely inside the Small Hut, you may have seen an orange rug with a "C" on it. This will toggle challenges, which will make the challenge description and completion status appear when changing levels using the two switches beside the teleporter. This is how it was planned ever since the Hall of Challenges was removed, but only now am I adding the changes to make challenges work! The rug doesn't function yet as that's the part the player will interact with. You'll step onto that rug to toggle challenges. Using the level change switches, you'll see whether this challenge has been completed before and what the goal is. After this, using the teleporter will warp you to the level you've selected, only with a challenge enabled (indicated with a timer on-screen). Said timer is separate from the timer that appears during speedruns, so you can still do challenges during them. "Luck bonus"? Is this random or based on something? You'll have to find out! Anyways, whoa, this is a big blog post! Look forward to when challenges return to Mary's Magical Adventure, player! They will be back in v1.95 or v2, whichever is the next release.